It’s been quite some time since I had a lot of fun with a WWE 2K game. After 2K18 — which was widely regarded as one of the worst games in the series by some margin — WWE 2K19 is a pleasant return to form for developers Yukes and Visual Concepts. 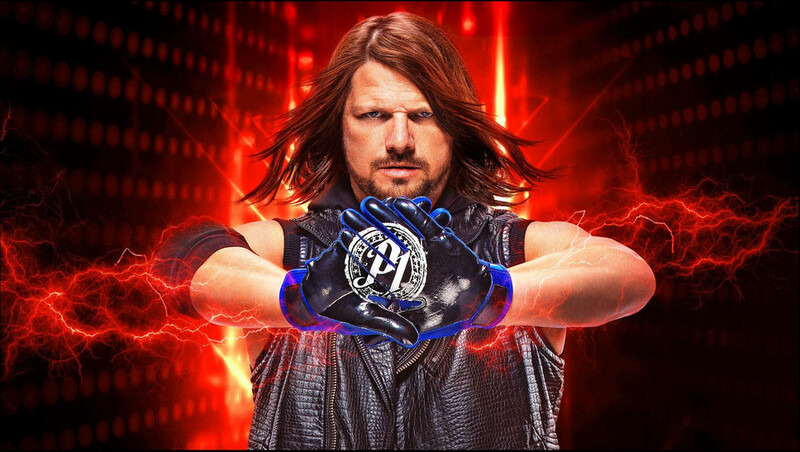 Gameplay systems are refined, MyCareer is reworked, and the return of Showcase mode makes this the most content-complete WWE 2K package in quite a while — it’s just a shame a few major issues keep it from reaching the series’ apex. 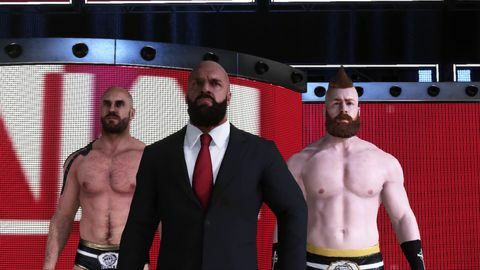 WWE 2K19 can’t be faulted for its presentation, which has been something the series has been absolutely nailing over the last few years. 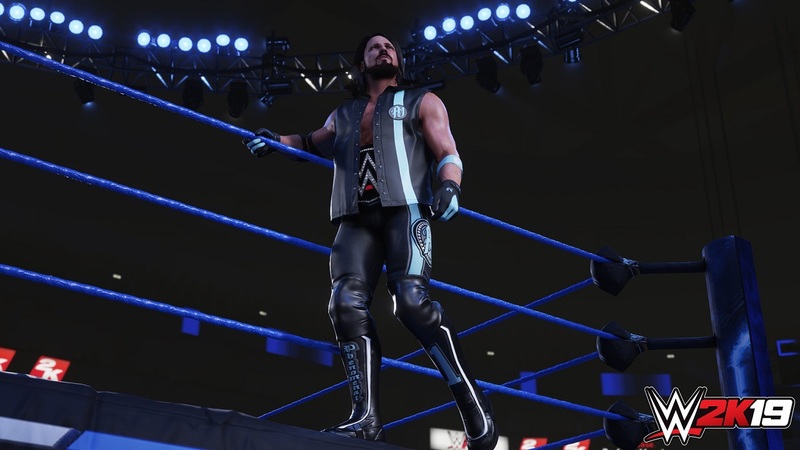 The new graphics engine, which was first introduced last year, does a lot to bring wrestlers to life — especially when it comes to their entrance. There’s still nothing quite like seeing The Undertaker or Seth Rollins make an entrance, and that’s replicated to near-perfection in 2K19. Considering I’ve been a wrestling fan for over fifteen years, it’s great to see how good this side of the coin is covered. There’s still nothing quite like seeing The Undertaker or Seth Rollins make an entrance, and that’s replicated to near-perfection in 2K19. When it comes to the bell ringing and competing in the squared circle, I’m still a bit iffy in regards to how simulation-based the series has become. As someone who grew up with classics like WWF No Mercy and the Smackdown vs Raw series, it did take quite some time to adjust to stamina meters and putting on a match for the audience (as each match is rated out of five, depending on a range of variables) while also attempting to win. That said, after some adjustment I did come to appreciate what 2K19’s attempting to do here — competition feels more balanced than ever, and timing your reversals (which are now limited and tied to a meter that regenerates as the match progresses) really gives the feeling of unpredictability to each contest, especially on higher difficulties. The major addition to gameplay this year comes by the way of the Payback System, which gives you abilities you can equip and make use of in matches. Each wrestler can equip two abilities going into a match, which range from being able to feign injury to capitalise on an unaware opponent or kick out of a pin at the last moment. Most of these are tied to a wrestler’s real personality, with the possum ability a key component of Alexa Bliss’s repertoire, for example, whereas the kick out ability is something you’d see allotted to John Cena. 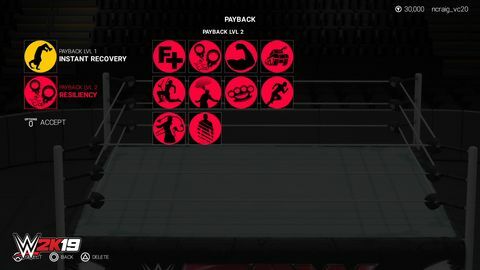 As I mentioned previously, you can edit these and equip whatever you want as you jump into a match with a wrestler, and they’re all pretty useful as long as you know what each do. 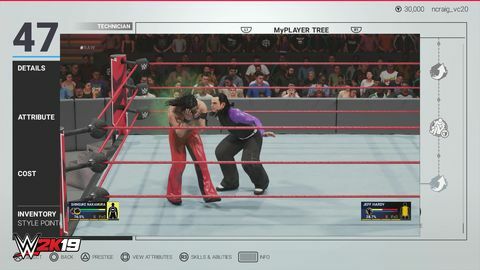 Everything seems to look a lot more like what you’d see on RAW or Smackdown now, and that adds a lot to the experience and immersion of the game. Something I noticed while jumping through the range of modes on offer was that the general animation work in 2K19 has been vastly improved, as well. Everything seems to look a lot more like what you’d see on RAW or Smackdown now, and that adds a lot to the experience and immersion of the game. Massive kick outs have weight to them, while major match ups that have gone the mile, see wrestlers struggling to catch their breath and haul themselves up via the ropes. It all adds a lot to replicate what we watch each week, and the drama of it makes for enjoyable gameplay for the most part. That said, something that continuously pulled me out of the immersion was the commentary — which has been a sticking point of the series for many years now. It’s absolutely awful, and continues to hurt the overall experience of playing WWE 2K. Repeated lines throughout a match, uninspired lines when a major finisher is hit, and weird reactions to minor attempts at pinfalls are just some of the issues that plague the commentary in 2K19, and there’s no end in sight for when this will ever be addressed. Further to this, while audience interaction and chanting has been improved quite noticeably, I still find cheering and booing to be much too inconsistent. Much like the commentary, when a major finisher is hit it’s almost as if the crowd’s watching something else and don’t care at all (and no, this wasn’t during a Roman Reigns match…), which also takes away from the overall experience. It’s a shame, because everything else in terms of gameplay has been improved dramatically in this year’s entry. MyCareer is a marked improvement over WWE 2K’s attempt at running a wrestling story over the last few iterations of the series, and has you fighting it out in the indie scene before progressing over to WWE and working your way towards main event glory. This year’s story also is fully voiced, and feels like the series’ first positive step forward in making something feel both meaningful and interesting to play. It’s dramatic, of course, but within the mode is a great set of winding paths that take you through the ropes as a burgeoning wrestling hopeful to main eventer in the biggest wrestling entertainment company in the world. reliving those moments of sheer brilliance from the ‘yes’ man was more than stellar. Starting off as a bit of a weakling, your created wrestler slowly levels up and unlocks new moves, entrances, and attire to make use of as you progress through the ranks. Combined with this is a skill tree system that allows you to gain overall rating and improve your abilities, making you more powerful along the way. It’s a neat idea, though I still don’t like the fact you have to spend virtual currency to dabble into loot boxes that’ll give you new moves and the like. For a mode that’s entirely focused around story and the single player experience, this feels a little cheap. While you do earn VC for playing through matches, it takes an age to earn enough to open these boxes. It’s not a great practice, and takes away from what is otherwise an enjoyable aside from everything else 2K19 has on offer. That said, I’m hopeful that we’ll see an expanded MyCareer story next year, as this one is certainly a promising start. 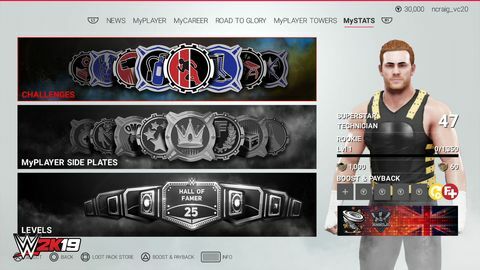 If MyCareer isn’t up your alley or you’re done with climbing the wrestling ranks, the return of Showcase Mode is more than welcomed. Bizarrely omitted last year, this year’s showcase follows the rise of Daniel Bryan — one of wrestling’s most beloved faces. 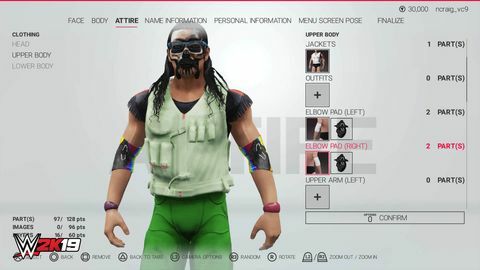 As has been the case for a while now, Showcase Mode has you play through some of the biggest matches throughout Bryan’s career, ranging from Bryan and Bray Wyatt’s cage match to when he won the gold at Wrestlemania 30. Bryan’s video to open up the mode is great, and really opens up on a character many of us wrestling fans have grown to love over the last ten or so years. If anything, this is where I had the most fun — reliving those moments of sheer brilliance from the ‘yes’ man was more than stellar, and I’m grateful to see the developers return to this mode. Another new addition to the suite of modes on offer in WWE 2K19 this year is 2K Towers, which plays very much like the fighting towers seen in the Mortal Kombat series. You choose a tower (which are updated daily and weekly) and slowly battle your way up to earn rewards. That said, these towers aren’t easy by any stretch, so they don’t really come recommended for those that are just starting off with the game. However, those who are seasoned veterans of the series will likely find a lot to enjoy here, as some of the match ups are a heck of a lot of fun to play through. Though it has its shortcomings, WWE 2K19 is a marked improvement over what’s come prior in the series. Gameplay feels smooth and enjoyable for the most part, MyCareer is good fun, and Showcase Mode is excellent. It’s a big step forward in a series that has been struggling over the last few years, and I’m happy to see it back on track. If you’re a fan of wrestling, you’ll certainly find something to enjoy in WWE 2K19. It definitely has its issues, but WWE 2K19 is the best game in the 2K series so far. Packed with content to work through and enjoyable MyCareer and Showcase modes, you’d be remiss not to give it a crack if you’re a wrestling fan. Ups Gameplay is refined and enjoyable. MyCareer is a big step forward. Showcase Mode is great. Presentation is still top drawer. Downs Commentary is woefully bad. The crowd still feel lifeless. Virtual currency reigns supreme.